4-star hotel in the 2nd district of Budapest. The hotel has 175 rooms. Novotel Budapest Danube is located on the Buda side of the city, between Margaret Bridge and Chain Bridge overlooking the Danube and the Parliament. The hotel is within 10 minutes walk of the world heritage listed Buda Castle and the downtown pedestrian shopping area. Airport: 21 km km >> Order your transfer! 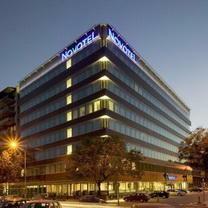 Novotel Budapest Danube, 4-star hotel with 175 Novation rooms. The hotel also features 3 meeting rooms for a maximum of 150 people. Meals are available 24 hours a day, either in the restaurant or the bar depending on the time of day. Room facilities: audible smoke alarm, sprinkler, airconditioning, safe deposit boksz, minibar, pay per view channel(s), radio, satellite/cable colour TV, telephone, WiFi wireless Internet access, high speed transmission line, hair dryer in bathroom. Café Danube, Snack Bar, Meeting rooms , Fitness Center, Sauna, WiFi wireless Internet access, Copy/print service available, Fax machine, Internet connectivity, Translating/interpreting service.